Joel Joseph of the Made in the USA Foundation says it's time to change the national conversation: Forget complaining about underemployment, unemployment, the economy and the federal deficit, and instead focus on what can be done, he says. In his view, one key solution to these issues is clear: If the country would rally behind American manufacturers and their products, the payoff would mean more jobs. His favorite phrase is "Buy American." More than 20 years ago, Joseph founded the Made in the USA Foundation to support U.S. manufacturers -- whether via litigation, lobbying for legislation like the Country of Origin Labeling Act, promoting companies that manufacture in the U.S., like on its online shopping platform, or doing its part to increase consumer awareness through its monthly newsletter, blog and seasonal guides. "Many Americans felt nothing in the U.S. is made here, but many of the finest products are made here," says Joseph, who last year launched the Foundation's Hall of Fame, inducting 20 companies from big names like Caterpillar (CAT) to small do-gooders like 19-employee Bill's Khakis. He wanted to showcase the best of American manufacturing. The winners earned plaudits as standouts in manufacturing, job creation and retention in the U.S., labor and environmental standards, quality and competitiveness. The foundation's second annual Hall of Fame celebration will be held July 2 at the Loews Santa Monica Beach Hotel. It's Joseph's hope that the day that states' representatives voted for the Declaration of Independence back in 1776 will come to be honored as America's "Made in the USA" holiday. More than five million U.S. manufacturing jobs were lost in the last decade, according to Robert Scott, director of trade and manufacturing policy research with the Economic Policy Institute. But manufacturing is essential to the U.S. economy, and companies bolstering it deserve applause. "They are forward looking and understand the real cost of offshoring," says Scott. The first thing you see on the company's website is "Made in Downtown LA -- vertically integrated manufacturing" (which minimizes the use of sub-contractors and offshore labor). How's that for American pride? The company, which makes fashionable basics, says on its website: "We believe that having manufacturing under the same roof as design, marketing, accounting, retail and distribution gives us the ability to quickly mobilize all departments, to respond directly to changes in the market, and to have complete visibility over our product -- start to finish. An added bonus -- the business model is inherently sustainable. Vertical integration by definition shrinks a company's carbon footprint, as the materials are not shipped back and forth internationally, across thousands of miles, in the production process." The 5,000-employee company's average factory worker makes $12 to $14 an hour. 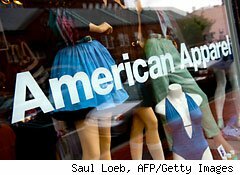 American Apparel is a bright spot in California's ailing economy. "We're honored to be recognized for our commitment to making apparel in the U.S. and doing it in a way that is fair and treats the workers right," says company spokesman Ryan Holiday. "I would never make my product elsewhere," says Bill Thomas, owner of the 19-employee Reading, Pa., company. Inspired by a pair of original World War II khakis he found at an Army store while in college, and unimpressed by what was on the market, he set out 20 years ago to save a symbolic piece of Americana. "We value domestic production. We don't fault others that go elsewhere. What we do works for us," he says. While Thomas says he doesn't lead with a buy American sales strategy, there is an American flag on his homepage. Despite competition from low-wage countries abroad, Mag Instrument, maker of the Mag-Lite flashlight, remains in the U.S.
"We believe we're the only major manufacturer still making its entire line of flashlights here," says Anthony Maglica, president and founder. 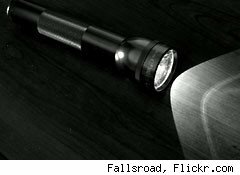 "Mag Instrument has chosen not to outsource the manufacturing of its flashlights to foreign countries in order to take advantage of cheap labor and less stringent environmental standards, which may also result in inferior quality," Mag Instrument explains on its website. "The outsourcing of manufacturing by U.S. companies has cost hundreds of thousands, if not millions of jobs." If Mag Instrument had outsourced, approximately 800 employees in Ontario, Calif. would have been lost. The 700-employee company lobbied against "job killer bills" which would handicap California-based manufacturers. "Nobody has cited the award as a reason why they do business with us, but given the competitive environment, receiving this recognition is good for the morale of the folks here who work hard," says Maglica. The makers of those cute little teddy bears you get on Valentine's Day have a sweet spot for home sweet home. 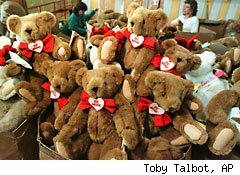 "We're still making every single bear by hand here," says company spokesperson Wendy Duval. The 30-year old, 175-employee Shelburne, Vt. company, works hard to support the local job force, adding hundreds of seasonal positions around Christmas, Valentine's Day and Mother's Day. "Being named to the Hall of Fame reinforces everything we hold as the cornerstone of our company," she adds. The company's website homepage features in hard-to-miss red and white the slogan "Handcrafted in the USA." And it's are so psyched about the Hall of Fame award, the company mentions it on the homepage in two places. The family-owned, 20 year-old East Barre, Vt. company hand-cuts and hand-sews its flannel apparel. "We could get fabric elsewhere and cheaper, but don't. We get calls from people asking if we still make our clothes here -- it's important," says Linda Baker, wife of owner, Mark Baker. "The award feels like vindication for sticking to our game plan to focus on quality and stay local, to not sell out," she adds. Zippo, nearly 80 years old, will soon cross the milestone of producing half a billion lighters, all made in Bradford, Pa.
Zippo is a classic American icon, historically and today, maintains David Warfel, director of global marketing. 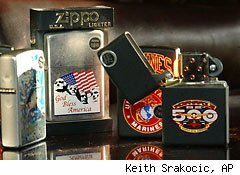 Zippo lighters are Hollywood and Broadway, having been in 1,500 movies, stage plays and television shows. The 1,000-employee company, is run by the founder's grandson. "Zippo is deeply rooted in this part of the country," says Warfel. "This is their life. They will do everything to protect the business here." Here's a look at some 2011 nominees. 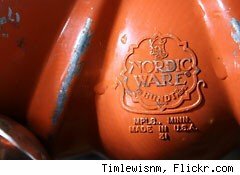 Since 1946, the cookware and bakeware company brings in more than $50 million revenue has "been keeping jobs in America." The reason is on its website. "We believe that keeping jobs in this country benefits everyone." This year, the 500-employee Minneapolis firm, hired 35 people. Staying stateside has advantages. Says Jennifer Dalquist, brand manager, "We're extraordinarily flexible and can adapt or change direction on a dime, which allows us to compete in the fast-paced retail market that we play in." 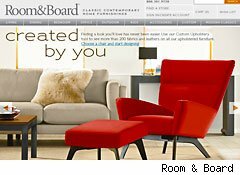 A few years ago, the folks at Room & Board spoke up. "On our website, in our catalog, we made it known that we make most of our product here," says Gene Wilson, director of vendor management and merchandising, of the family-owned, private home furnishings company. The Minneapolis-based firm supports manufacturers and small, family-owned businesses -- artisans who handcraft each piece. More than 90% of the furniture they sell is made here, a percentage that will increase next year. 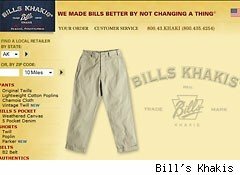 The 31-year-old, 625-employee, 11-store company, had $227 million in sales in 2010. Roy Toys are 100% American made, and it's a big deal to the company. Check out its website: "Our toys are crafted in the USA from pine trees grown in U.S. forests." The site also provides links to other makers of American-Made toys. Sales manager Susan Dennison says the earth-friendly line of toys come from locally grown wood and mills that follow sustainable forest management practices. The Machias, Maine, company, which was founded in the 1930s, has five full-time employees and hires 30 to 35 seasonal workers each August. 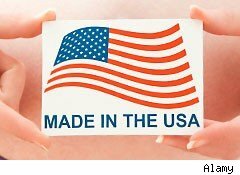 Selling an American-made product is personally fulfilling for the employees, and has recently become a business advantage for the company. "In 1992, we couldn't get bigger companies to look at us. They were looking overseas," says Dennison. "Now, they realize we are cost efficient. They can get our products quickly." 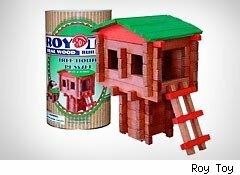 Also, more U.S. consumers want homegrown products, good news for Roy Toy. 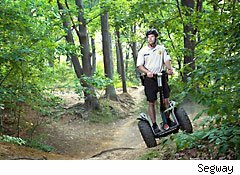 About a decade ago, Segway's mission was to make it possible for people to answer yes to questions like: Can you be more productive and use less energy? The result: the first self-balancing, zero-emissions personal transportation vehicle, the Segway Personal Transporter. The Bedford, N.H., firm employs 120 between its U.S. headquarters and service centers abroad. "Being nominated alongside Harley Davidson strengthens our position to expand and grow both our domestic and international market share," says Matthew Dailida, vice president." When you think of pianos, the name Steinway leaps to mind. "Many people don't realize we're an American company. The best of everything does not come from Europe," says Anthony Gilroy, director of marketing and communications for Steinway & Sons. (LVB). "We are an American story. 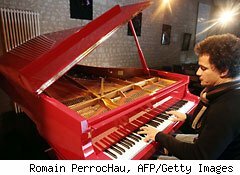 Almost everything we use in our pianos, from start to finish is from the U.S.," he says. The nearly 1,000-employee Steinway & Sons, founded in 1853, is legendary for quality. Each Steinway grand piano takes nearly a year to create. Sharon Lebon, co-founder of Three Dots, a maker of contemporary sportswear in Garden Grove, Calif., says keeping manufacturing in this country is a priority. The 200-employee private company, started in 1995, designs, cuts, sews and ships locally, supporting hundreds of people in the community as contractors and vendors. "We are conscious of margins, but go with our values versus the bottom line," says Lebon. "You lose control when you go overseas," says Lebon, who believes quality and timely delivery kept the company strong during tough times. She adds, "We need to keep people employed here. It is a nice feeling when I think about how many families we support."